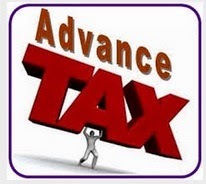 Friends, Payment of advance tax is due on 15-03-2015 for all assessees whose tax amount exceeds Rs. 10,000/- in the Financial Year 2014-15 or Assessment Year 2015-16. There are two category of assessees named Corporate or Non-Corporate. The amount of Advance Tax can be deposited through Challan No. 280 by selecting (100) as the type of payment. In case Advance Tax is not paid in time, Assessee has to pay interest on account of non payment or late payment of Advance Tax under section 234B or 234C. 58[Interest for defaults in payment of advance tax. 234B. (1) Subject to the other provisions of this section, where, in any financial year, an assessee who is liable to pay advance tax under section 208 has failed to pay such tax or, where the advance tax paid by such assessee under the provisions ofsection 210 is less than ninety per cent of the assessed tax, the assessee shall59 be liable to pay simple interest at the rate of 60[one] per cent for every month or part of a month comprised in the period from the 1st day of April next following such financial year 61[to the date of determination of total income under sub-section (1) of section 143 62[and where a regular assessment is made, to the date of such regular assessment, on an amount]] equal to the assessed tax or, as the case may be, on the amount by which the advance tax paid as aforesaid falls short of the assessed tax. Explanation 2.—Where, in relation to an assessment year, an assessment is made for the first time under section 147 66[or section 153A], the assessment so made shall be regarded as a regular assessment for the purposes of this section. (ii) thereafter, interest shall be calculated at the rate aforesaid on the amount by which the tax so paid together with the advance tax paid falls short of the assessed tax. (3) Where, as a result of an order of reassessment or recomputation under section 147 69[or section 153A], the amount on which interest was payable under sub-section (1) is increased, the assessee shall be liable to pay simple interest at the rate of70[one] per cent for every month or part of a month comprised in the period commencing on the day following 71[the date of determination of total income under sub-section (1) of section 143 72[and where a regular assessment is made as is referred to in sub-section (1) following the date of such regular assessment]] and ending on the date of the reassessment or recomputation under section 147 73[or section 153A], on the amount by which the tax on the total income determined on the basis of the reassessment or recomputation exceeds the tax on the total income determined 74[under sub-section (1) of section 143 or] on the basis of the regular assessment aforesaid. 77[Interest for deferment of advance tax.